This post was originally titled “How I created a presentation viewed by over 250,000 people on Slideshare in just 8 hours”, but as the numbers kept increasing to now well-over 2,500,000 viewers, the title no longer made sense. A few years back, I wrote a blog post about how I had begun to write down everything I learned and the effects it had on my life. Thursday March 28th, after a total of 8 hours of work, I published 26 Time Management Hacks I Wish I’d Known at 20 on Slideshare and left for the evening. The next morning was Good Friday; my expectations for the presentation were low. When I woke up, I was surprised to find out that the presentation had made the Slideshare homepage. I knew what to expect; It was not my first time making the Slideshare homepage. I was happy getting 20 to 40,000 views, but I never expected that the presentation would stay there for 2 full days garnering over 2,000 views per hour. Perhaps it was the long weekend and someone at Slideshare forgot to change the top presentations, but when they took down the presentation on Sunday, it had been viewed more than 65,000 times. In the first few days, the presentation had been shared hundreds of times on Twitter, Facebook and LinkedIn. By Sunday afternoon, people started clicking and 8,000 new people were viewing the presentation every hour. In marketing lingo, it had “gone viral”. The presentation would keep this pace for the rest of the week. Along the way, it would get featured in the LinkedIn and Slideshare (twice) newsletters, be posted on the Reddit and Lifehacker homepages and, Business Insider would republish it on their Website. The presentation was shared by big brands, influencers and many Websites I had never heard of. For the first week, I was unable to keep track of all the shares, likes and comments that were coming in. I tried to thank everyone, but at some point I could only give up. 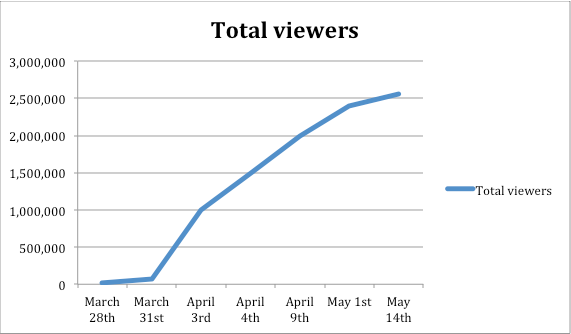 It took over a week and a half for the traffic to slow down at a – still respectable – pace of 5,000 viewers per hour. The presentation had by far exceeded any expectations I could have had. All vanity objectives had been reached. Views and shares are great, but they’re short-lived. What really drives value are the relationships created along the way. Brands pay hundreds of thousands of dollars for this kind of visibility. Is it worth it? Creating quality content is key. Many viewers shared hesitations with looking at another “26 …” list presentation. Avoiding clichés is very important. Time management is an universal pain point. Viewers from all continents reached out and found value in the content. Many people found the presentation great because it is simple but not simplistic and, the lessons can be applied in the real world. The feedback was tremendously positive on Twitter, LinkedIn, Slideshare and Facebook. Feedback was more negative on tech Websites (eg. Reddit). Developers complained about the use of the term « hacks ». Shares on Twitter and Facebook are short-lived. Even shares by Twitter users with 50-100k followers rarely generated more than 10-12 retweets. Shares on LinkedIn are longer-lived. These shares consistently drove a lot of traffic and were highly valuable. LinkedIn is great for content marketing. Based on the number of people who reached out wanting a copy of the presentation, the feedback I got and the amount of traffic the presentation received, I estimate that I could have generated over $20,000 from a 0.5% conversion rate had I sold an expanded 26 Time Management Hacks I Wish I’d known at 20 ebook. Not being able to monetize the viewership became frustrating after the first 250,000 viewers. At an industry average CPM of $7, I calculate that Business Insider generated over $15,000 of advertising revenue from my content. However, the bulk of the Business Insider traffic (almost 1.7 million viewers now) came from their Website. Re-share rate was very low. The personal brand impact of the presentation is great, but unfortunately incalculable. The presentation caught the eye of many high quality / high ranked people in the business world abroad first then locally. I will be able to leverage this success moving forward. My real objective creating the presentation was to test out a marketing strategy for the book I’m currently writing. In that regard, the campaign was very successful and, I honestly think that I can almost guarantee 20 to 40k views for my future presentations using Slideshare as a blogging channel. Creating a massively viral presentation in just a day may have been the most productive 8 hours of my working life. Unfortunately, expectations of success have gone up and this type of virality will be very hard to reproduce. Even with a lot of research, going viral is not a strategy. I could have just as easily wrote a full ebook and created a 28-slide presentation to receive just a few thousand views. It’s important to be reactive in the face of virality, but virality can hardly be predicted. This time, I did not have enough availability to properly capitalize on the opportunities. Going viral once is luck. If I do go viral a second time, it will mean that I have understood part of the system. Now, I at least have a wider base audience and a great portfolio piece.